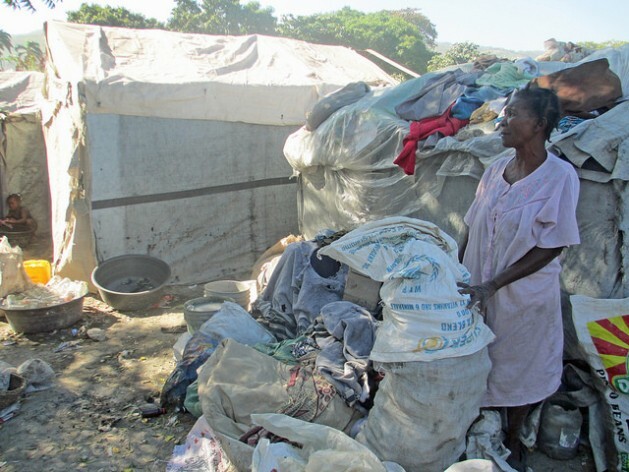 Carrefour, HAITI, Jan 20 2014 (IPS) - Mimose Gérard sits in her tent at Gaston Margron camp, surrounded by large bags filled with plastic bottles. She earns just pennies for each, but that’s better than nothing. But a year later, those families “face another housing crisis as their housing subsidy runs out,” a recent study from the Washington-based Institute for Justice and Democracy in Haiti found. Overall, of the 6.43 billion dollars disbursed by bilateral and multilateral donors to Haiti from 2010 to 2012, just nine percent went through the Haitian government while the rest went to foreign contractors. Nor surprisingly, Ilien and other camp residents are afraid of being infected with any one of Haiti’s water-borne diseases, particularly cholera. Studies by numerous authorities, incuding the U.S. Centres for Disease Control (CDC), say the bacteria was brought to Haiti by Nepali peacekeepers who are part of the 9,500‑strong U.N. Stabilisation Mission in Haiti (MINUSTAH). there are water stations in many parts of the country . they won t show the improvements.